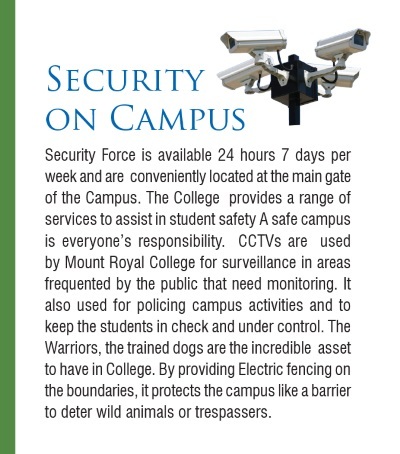 MOUNT ROYAL COLLEGE (MRC)-a new generation Arts & Science College, assuring a highly enriching and rewarding tenure. By offering training in international standard MRC aims at creating qualified professionals in a globalised context. In view of the technological growth and development at the national and international level, the college has introduced many new facilities in the campus for operational efficiency and convenience. By installing an ATM/POS machine in the college premises, individual Smart Card is provided for each student for all their payments in the campus to avoid unnecessary spending. Similarly, for any payment outside the campus all students are being provided with a Co-branded International Debit Card in association with leading banks. Thus the 100% Wifi Campus of MRC has become the first 100% CASH LESS CAMPUS among such professional colleges in the state. The College has already been branded as a totally ALCOHOL FREE, TOBACCO FREE and RAGGING FREE CAMPUS. 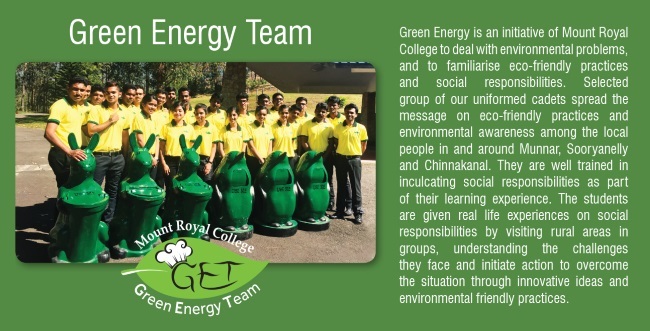 The College has also introduced the BUDDY SYSTEM, offering guidance, assistance and motivation by 2 senior students and a faculty, to all newly admitted students, for their exclusive personality and professional development. For inculcating a healthy competitive spirit in each student all are compulsorily enrolled in The ACHIEVERS’GUILD categorising them under Silver, Gold, Platinum and Diamond groups based on strict parameters. Elevation to higher group will attract more exposure and better opportunities even for employment. For our students the campus life is a period of transformation into a responsible global citizens, making them capable of facing the future with resilience and optimism. Therefore a graduate of MRC will be highly sought after in the industry and the work place, valued for their education, range of skills and professionalism. With this introduction I whole heartedly invite you to join hands with us, to strengthen your capabilities in order to achieve excellence beyond imagination. Life in the campus is not a training ground for a sedentary lifestyle circling around the class room tables; it offers a wide range of activities for a sound mind and a healthy body. Being a 100% residential institution, excellent facilities are offered in the residential campus for indoor and outdoor activities which include basketball, volley ball and shuttle courts, a high-tech gymnasium with specialty equipment, a jumbo sized sauna and steam bath, state of the art swimming pool with Jacuzzi, fully stocked library, modern class rooms, WIFI connected with Optical Fibre and above all a functional helipad, to name a few. As part of the earnest desire of the management to create one of the well disciplined residential colleges in the state, all students shall compulsorily observe the prescribed code of conduct inside and outside the campus. In general, the following are treated as a breach of discipline. Neglect or indifference towards assignments. Misconduct or misbehavior of any kind towards teachers, employees, visitors or fellow students. inside or outside the campus. Causing disturbance in the normal functioning of classes, office or library. Causing damage to the furniture or any property of the college or hostel. Ragging of any form, even for fun, inside or outside the campus. The campus being smoke free, alcohol free and tobacco free, violations of any kind will be strictly dealt with. College campus is a place to find valuable friendship and to cherish unforgettable moments. We, here at MRC strongly condemn any kind of ragging practices. Our students welcome the fresher’s with flowers and advices and they do not believe in violence or unhealthy practices. Our faculty members impart good values with education and that is what set MRC apart.